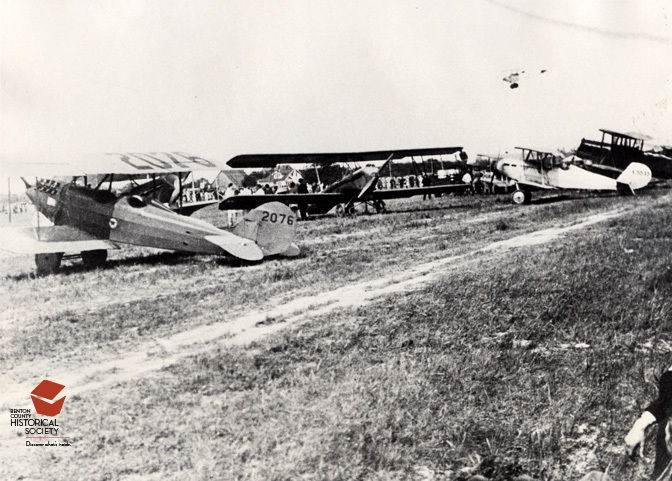 Airport development came about with the expansion of airmail in the 1920s. Cities along the main transcontinental and feeder routes began to improve airports while other places built airports in hopes of attracting business and as a matter of civic pride. In 1928, the Corvallis Chamber of Commerce rented land just west of Highland Boulevard between Grant Avenue and Circle Boulevard for an airport. They graded two runways and outlined them in white and painted "Corvallis" on the grass in large white letters. A windsock and two hangars stood along Grant Avenue. Henry Ford pioneered to construction of concrete runways at the Dearborn, Michigan airport in 1926. To improve drainage and accommodate the larger, heavier planes such as Ford's Trimotor, other cities paved their runways and offered more ground services. After voters in Corvallis rejected a bond measure to upgrade the Grant Avenue airport, the Chamber of Commerce withdrew its support and the airport closed in 1933.